Iverson had learned that hedge fund billionaire John Paulson, whose company bought Steinway Musical Instruments in 2013, was recently named to Donald Trump’s economic team. The Sweeney is Michael Sweeney, former Steinway CEO, with whom Iverson had a cordial relationship. Sweeney left the company last week. According to CNBC, “A Steinway spokesman would not say if Sweeney, 58, resigned or was forced out of the company, or reveal what led to him leaving.” Ron Losby, Steinway president since 2008, has taken over as CEO. Iverson played a solo concert in Minneapolis on Saturday, August 20. He answered a few questions afterward about his post and Steinway decision. Ethan Iverson: [I was told] I could have all the privileges of being a Steinway artist, but I wouldn’t become a full Steinway artist until I actually owned a Steinway. I bought a low-end Boston, which is a great little piano, and was going to work up to buying a Steinway. But I was already thinking about making requests for [Steinway] pianos for certain venues. They gave us a great deal on the piano we used to make our new album. Did you talk with Reid and Dave about your post? I talked to a couple of people in the industry and fellow pianists. I didn’t really talk to Reid and Dave because for years The Bad Plus has played whatever pianos are there at the venue. I think there’s plenty of room to worry about other things about your musicianship before you become a piano diva, especially if you’re a jazz player. If you’re playing virtuosic classical music for a living, that’s a different kettle of fish. Have you gotten any pushback on your post? Everybody seems to think I’m the hero of the hour. Both Marc-André Hamelin – in my opinion, the greatest living classical pianist – and Thomas Adès – whom I think is the greatest composer – tweeted positive things. Alex Ross put it on his blog [The Rest Is Noise] today. [Ross called it “an important, dismaying read.”] A lot of people retweeted it. 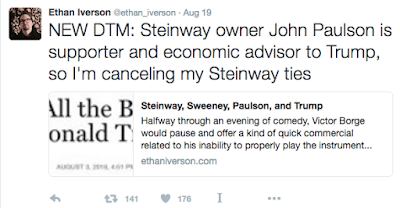 I was at dinner with a person who’s in the financial world, and he told me Paulson was the Steinway owner and was Trump’s economic advisor. I hadn’t connected those dots. I think probably everyone in music just looked at the list of Donald Trump economic advisors and didn’t really pay any attention. 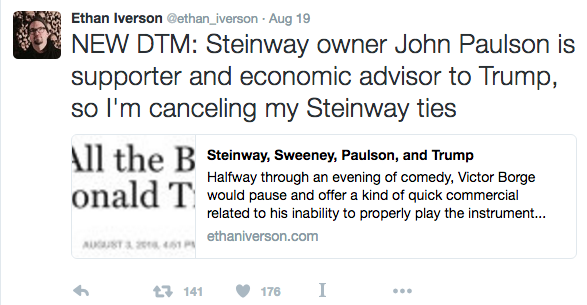 I didn’t really pay any attention either, but I did see Paulson speak at the Steinway gala [on March 14] and had a negative impression. Then I was like, “Wait a minute, who is this guy?” And I started doing my research, and it became obvious to me that this was something we should know about. It’s worth knowing so people think, “Maybe I don’t need to go with Steinway. Maybe I can go with someone else.” There’s the first African-American piano maker, a guy named Warren Shadd, and I’ve been thinking I should go down and play a Shadd piano. There are some extraordinary Yamahas now. They’ve really upped their high-end game. 60 or 70 years ago, there were about 50 piano makers, and now it’s essentially down to a couple, and everyone wants to play a Steinway because it’s the only handmade one. It would be nice to have a little more competition for Steinway. This is a serious decision for you as a pianist. I lost a night of sleep over it. I thought, “Am I really going to do this?” But I figured, “Who knows what the future brings?” It’s not like I’m never going to play any Steinways anymore. There are Steinways at a lot of venues. What I’m really giving up is being in that elite class of Steinway pianists. And that’s really not my personality anyway. I bang around Bohemian style. That’s sort of what I believe in. And frankly, I think that East Coast elite stuff is really a drag. And for someone like John Paulson, I think almost any musician is probably not much … I can’t speak for Paulson, but I’ve met various rich people on the East Coast, and sometimes they have an appreciation of art only as something that ornaments their wealth. I think that perspective is horrible. Being economic advisor to Donald Trump, as I wrote, just crosses the line. What do you see as the consequences for you personally? Beyond not being a Steinway artist? I like some of the people at Steinway, and I know it was probably not good for them that I posted this. So that was a little problematic. I don’t want to make life worse for anybody. On the other hand, I’m just a little jazz blogger. It’s hard to know what the consequences are of anything. But it was totally dark and I turned on the light. And there might be consequences there, I suppose. Who knows? Is this any of my business? Maybe I should just let it lie. Truthfully, I don’t think it’s going to make any difference to anything. But if just a few people I know and respect who didn’t know about it now know about it, and it’s part of the conversation, that’s as much as I could hope for. On August 23, Norman Lebrecht featured Iverson’s post on his Slipped Disc blog, with (nice touch, Norman) a photograph of a Steinway lying on its back.